Underwater Hunters is a company formed by Skip Hellen. The purpose of this company is to bring valuable information and innovative products to the big game fishing community. Skips products are designed and developed to provide reliable service, pleasure, and success to the most demanding big game hunter. Skip has fished and hunted all over the world while catching some of the most prized big game fish. Today Skip is recognized as one of the worlds leading experts in the field of advanced big game hunting and fishing. 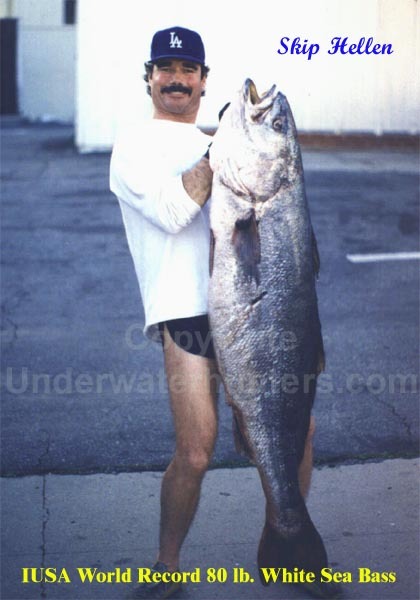 Skip Hellen still participated in a few spearfishing competitions, and most recently won 1st place in the Long Beach Neptune's Blue Water Meet. 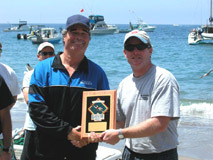 This prestigious event is held annually at Catalina Island, California and attracts international participation. Skip competed in his first blue water meet in 1966 and now holds the coveted title as blue water meet champion. Although Skip holds perhaps the most coveted spearfishing record in California, he has landed many of the most prized big game fish in the world. Exotic fish like Bluefin and Yellowfin Tuna, Wahoo, Grouper, Dorado just to name a few. Skip gained International acclaim while he served over ten years as the president of the (IUSA) International Underwater Spearfishing Association. His thorough understanding of underwater hunting equipment and strategies has lead to many new equipment advances. He has applied his decades of experience to the production of his innovative underwater hunting products. Along with developing new equipment Skip has studied fish, their habits, weather patterns, tides and currents as well as water temperature fluctuations and how these variables effect fish behavior to better understand when and where fish will be. The art or science of locating game fish is a very complex guessing game and only a few in the world are recognized as experts in this field, Skip is one of these few. Skip is currently writing a book covering the art or science of finding big game fish. This book will cover such subjects as big game fish seasons, marine weather and water conditions as well as tides and how they effect currents. This book will reveal some of the most guarded secrets in the sport fishing and underwater hunting communities and how to find the record sized trophy fish. New Creative Products Among the products of Underwater Hunters is the back brace weight belt which has attracted a great deal of interest. This new full support weight belt is designed to evenly distributes the weight of a belt across a much larger area than a traditional belt. This new design greatly reduces the pressure and strain on the lower spine. In many cases the use of this new weight belt allows an underwater hunter hours of enjoyable hunting pain free.